The Budget Babe was mentioned in an article titled "Young, Fabulous, Broke: Budgeting Tips" by Nicole Fineo in The Indepedent Florida Alligator, April 16, 2009. Read the full article. As the recession hits its one year anniversary (aww), we're actually beginning to see signs that we might be bottoming out. Good timing, considering Net-a-Porter, the premiere online destination for designer fashions, just launched their online outlet store: theOutnet.com. Budget Babe readers probably won't be overly excited by this news (seeing an Alexander McQueen Elvie python tote drop from $5,380 to $2,690 isn't exactly a great deal) BUT you must admit it's fun to look. And laugh—ha! At those silly, silly prices. However, theOutnet.com is less than a day old, and is promising to offer patrons some seductive deals that may have me eating my words. Each month, theOutnet will host time-limited Pop-Up Sales, Giveaways and Going, Going, Gone Sales that will provide shoppers that "'get it before it goes' buzz." Hmmm, wonder if they'll have a Mulberry tote for under $200. A girl can dream, can't she? Check out theOutnet.com and let me know what you think! 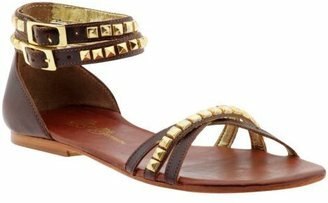 Today's "look for less" was requested by a reader who says she loves these Matt Bernson Barracuda sandals, but isn't loving the price—they're $175 at Piperlime.com. Celebs like Sarah Jessica Parker, Miley Cyrus and Leighton Meester are all fans of Matt Bernson, too, a brand that distinguishes itself by blending luxurious details with comfortable styling. Each pair is hand cut leather and "soulfully made in Brazil," says their website (find out more about Matt Bernson shoes at mattbernson.com), which explains the higher prices. It's always fun and enlightening to take a look inside someone's purse. The contents can reveal quite a bit about a person's life! So for today's hot topic, I'm inviting you to spill the beans on what you're carrying in your handbag. Feel free to share what kind of bag it is, too! Ok, now what's in yours?